I like to know where I’m going before I get there. While a certain amount of surprise and discovery on a trip is great, I want a firm foundation about the history and culture of a place, especially as it informs the architecture that is always, always, always the focus, before I get there. Rome had been such a central part of my education–somewhat in secondary ed, for sure in architecture school–that I could understand the city–spatially and historically–with relative ease. That’s not so much the case for Istanbul, where I will be one week from today. 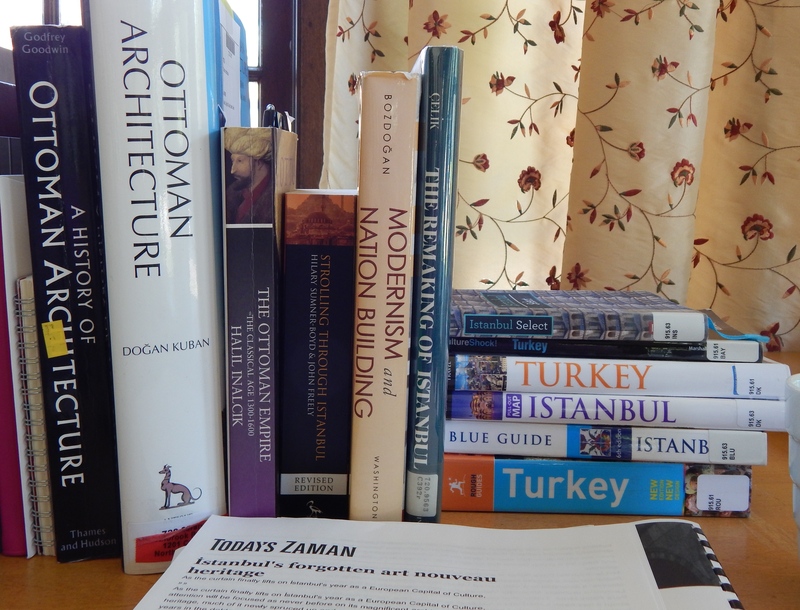 The Ottoman Empire just didn’t rate in my history classes, except for one pretty amazing and deep seminar that was a fluke of going to school at a place that had a Byzantinist on the faculty. For the rest of the profs, Istanbul didn’t really exist, except for that one big converted mosque that really only fit into the story because it was built as a great Christian cathedral once upon a time. Although my profs’ side-stepping of an empire that lasted over six centuries does seem a bit nuts, I don’t hold it against them. This ease of forgiveness is, no doubt, helped along by hoping I am not doing irreparable harm to my students through the content I choose to include/exclude. Every semester-long course requires that historians package a comprehensible narrative into a vessel of about thirty-five hours. Our job is as much about editing as anything else. But it doesn’t change the fact that I want to hit Turkish soil with my brain full o’facts and my eyes already at least partially introduced to wonders that await. That means that this short period leading up to the trip is a pretty intense study to ramp up to a certain level of comprehension; but in fact that is perhaps one of the great gifts of graduate education, especially at the Ph.D. level, which taught me that with enough perseverance, focus, and–Lord knows–enough books and articles, you can make yourself sound like a pretty smart cookie in any subject. And so while my students have all flown the coop, I am the sole person wandering through the library, collecting books loaned from distant campuses, studying maps and guides at home, basically cramming for an exam that I’ve imposed upon myself.